Only since about 700 B.C. do we find a consistent record of the monetary system of the world. The credit for the creation of an official coinage system belongs to the Ionians or Lydians within the Greek Empire of Asia Minor – modern day Turkey. Although the merchants of the day were affixing their own seal of value to the ingots that circulated freely, corruption was an integral part of human nature then as it is today. The first official coinage was a standardization of weights. The design was merely an incuse square on the reverse with the obverse fairly smooth. However, the content of gold still varied considerably. According to Herodotus, the Greek Historian writing about 430 B.C. ; “the first people we know of to strike coins of gold and silver” were the Lydians. The surest proof of Lydia’s claim to this monetary invention are tiny metal ingots discovered during the 20th century by archaeologists working on the site of ancient Sardis – the ancient capital city of Lydia. The metal used in the minting of these coins is known as electrum, which is a natural pale yellow alloy of gold and silver. Electrum was found in the Lydian mountains in abundance and as alluvial deposits in the bed of the Pactolus River. The coinage was still very rare and in purchasing power, one coin would feed a family for more than an entire month. It is unlikely that the first issues of official coinage served a broad purpose such as facilitating a money supply. Instead, this newly invented medium of exchange tended to serve a more practical function in facilitating large financial transactions along with the payment made to military troops. From ancient writings in clay tablets, we can safely estimate that a single coin represented a month’s salary to a soldier. These coins weighed 14 grammes on average and they were called the “stater” which meant “weigher” or the norm of value. Fractional pieces appear to have been coined from an extremely early date. Hence, there were fractional pieces denominated in half, third and sixth portions of a stater. Nevertheless, even the value of such fractional pieces in terms of purchasing power would have still precluded them from any wide use in normal daily transactions. heated and then poured onto the anvil, which yielded the striations. As little droplets were poured onto this surface, a punch bearing a design was then hammered down upon it during the cooling process thereby impressing the design with the reverse acquiring the impression of the striations. Around 600 B.C. under the reign of King Alyattes (610-561 B.C. ), a new type of coinage was invented. The anvil surface, which yielded the striations, was replaced by a lower die. This lower die bore an intaglio design of the forepart of a lion. The electrum was then poured into plancets and adjusted to a standard weight. The plancet was then placed onto the die and a hammer was then used to impress the punch that forced the metal into the lower die while leaving the irregular incuse mark on now what became the reverse side of the coin. The lion design was the royal badge, a symbol of the king’s authority. This symbol guaranteed the weight of the coins. However, the proportion of gold and silver were not fixed. The coins were minted from electrum as found in its natural state meaning that the content of gold varied considerably. This new invention of standardization of metal for the purpose of currency quickly spread throughout Asia Minor. Most of the major cities began to issue electrum staters from about 480 BC onward. The illustration here shows the variety of types issued by the city-state of Mysia, Cyzicus between 480BC and 350BC. Overall, these electrum issues were largely restricted in circulation to within Asia Minor. This official standard of circulating staters prevailed for nearly 100 years. Eventually, the first major reform of the monetary system was instituted by the middle of the 6th century B.C. in Lydia. King Kroisos (Croesus) designed his own seal of official value. The design was the forefront of a lion confronting the forefront of a bull. The reverse was merely an incuse square and the method of coinage remained the same. However, this revision of the monetary system was a critical starting point in the bi-metallic monetary system of man that would last until the mid 1960s. 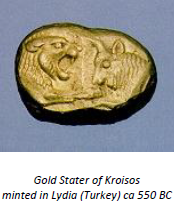 Kroisos broke the coinage into gold and silver and doing away with the former electrum standard. The electrum was refined into gold and silver from which a new system of values emerged. The gold stater was lighter in weight than the former electrum staters – a mere 8 grammes. However, this new stater was virtually pure gold, averaging about 98%, which was as pure as possible given the technology of that era. Fractional denominations were struck down to 1/12 of a stater known as the hemihekton. For the first time, silver denominations emerged in the monetary system of the world. The effective ratio of silver to gold as coined under Kroisos was 13 1/3 to 1. The weight of the silver coinage was set as to provide a value ratio of 1/10th that of the gold coins. The silver stater was nearly 11 grammes in actual weight compared to 8 grammes in weight of the gold stater. This new bimetallic monetary system was an efficient means of providing a wide variety of denominations. It also quickly drove the previous electrum issues out of circulation. The silver hemihekton was the smallest denomination equal to 1/120th of a gold stater. In size, however, such coins were extremely tiny. This was the primary problem with the system that finally gave way to the introduction of bronze coinage during the 4th century B.C. to facilitate a more practical fractional coinage system. Simultaneously, when Lydia moved to the bimetallic system, its neighboring Greek cities throughout Asia Minor continued to employ electrum. Silver was introduced in these states within Asia Minor toward the later decades of the 6th century B.C., but silver continued to play a very minor role even at that point in time. The standards seem to vary considerably. The primary cities minting coinage were Ephesos, Phokaia and Miletos. The Euboic standard was based upon an electrum stater weighting 17.2 grammes while the Phokaic standard appears to have been 16.1 grammes. At Miletos, the standard appears to have been based upon a stater of 14.1 grammes. As you can see, Asia Minor was a complicated place in terms of foreign exchange. As it would appear, eventually the Phokaic standard was adopted throughout Asia Minor. This electrum-based standard continued well into the time of Alexander the Great despite mainland Greece’s eventual implementation of silver. In 546 B.C., the Lydian Kingdom fell to the invading army of King Cyrus of Persia. Interestingly enough, the Persians found this monetary system quite useful. 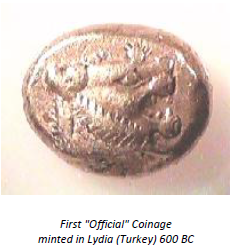 Thereafter, the coinage first invented in Lydia continued to be minted from Sardis (Lydia) employing the same standard with the very same designs. Eventually, the designs employed in the production of the coinage were finally changed during the later part of the 6th century B.C. using a new image of the Persian king. The obverse now bore the figure of a man holding a spear and a bow with a quiver of arrows on his back. This archer was in a crouched kneeling position giving the appearance of also running at the same time. Some believe that this was a representation of King Darius the Great of Persia (521-486 B.C.). The name of the coins also changed. No longer were they referred to as a stater, but the new name of “daric” was introduced. This is often why the portrait of the archer is believed to represent King Darius. 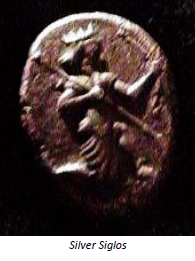 Given the rarity of the Lydian coins and the more comparatively common daric pieces , it is highly probable that the Persians melted down the Lydian pieces and recoined them with the image of Darius. The silver coinage was also continued. The old silver half-stater was now known as the “siglos” within the Persian Empire. Slight modifications to the weights were carried out over time. Nonetheless, these modifications are very slight and most likely reflect the changing value between silver and gold rather than a conscious effort to create inflation on the part of the state. In purchasing power, we also know that the pay for a soldier in the Persian army was one and a half gold darics at this point in history. The bow and arrow was the chief weapon of the Persian soldier and therefore this design was rather symbolic. The output of this particular coin must have been extremely large. One major expedition alone is recorded to have cost the King 4 million gold darics. These gold darics were effectively minted without change for nearly 200 years until the fall of the Persian Empire in the year 331 B.C. at the hand of Alexander the Great.